Grab your pen and paper (or computer and keyboard) and get to writing. Submit your stories for one or both of these anthologies before April 20th, then join us at MOBICON. Grim Trojan has made arrangements with MOBICON to present the winner of our writing contest at their comic con. Plans are being made to have a presentation during the con where any of the winning authors who attend will be presented with their prizes. Their stories will discussed and time permitting perhaps they will be asked to read excerpts from their stories. We also plan to reveal the cover art for both books at MOBICON. Please read the following very carefully. There are TWO (2) contests that will be publishing TWO (2) different books. There will be a 1st Place , 2nd Place and 3rd Place Winner for each book. The contest rules differ depending on which book you submit to. You may submit up to three stories for each book. In addition to having bragging rights for winning, the top three best stories of each book will be featured (published) in the book(s) the authors submitted to. The top three stories of each book will be our First, Second and Third Prize winners. Depending on the number of pages in each book at the time of printing, more than just the top three stories of each book may be published. The contest begins now and runs until 11:59pm (central) April 20, 2019. Winners will be announced at MOBICON (May 24-26) and posted on this page by June 1, 2019. Winners will be notified by e-mail (after MOBICON). Anyone who does not agree to all of the terms listed below will not be published. By submitting your story you are agreeing to these terms. Make sure you read the rules for each book very carefully. They are different. Note that because of the nature of the Runes & Realms book the author gives up all rights to the submitted work while authors submitting stories to the Sci-fi/Fantasy anthology will retain their rights. Please send your submissions or any questions you may have about this contest to steven@grimtrojan.com. *Scroll down the page—past the contest details for the Sci-Fi/Fantasy Anthology (and the pictures)—to see details for the Runes & Realms contest. We've posted twelve pieces of art by Steven Moore below. Using one of the pictures as your inspiration, create a story to bring the picture to life (MAXIMUM of 15,000 words—no minimum). The entirety of the story should be submitted by email as an attached Word Document (.doc), prepared in standard manuscript format (or close to standard manuscript format). Use these guidelines as a recommendation—some flexibility will be allowed, but if the fonts used are difficult to read or the formatting of the pages distracts your entry may be removed from the contest. Standard manuscript format means margins of at least 1 inch all the way around; indented paragraphs (0.25" please) (NOT TABS); double-spaced text; Arial, Times New Roman or Garamond in 12 pitch with Justified text. Make sure the header includes your name and/or the title of the book, and the footer has the page number (on every page). Title your work: Sci-fi/Fantasy Anthology — Your Story Name — Author Name. In the subject line of the e-mail, include Sci-Fi/Fantasy Anthology, last name, title of work, and word count (e.g. Sci-Fi/Fantasy Anthology, Moore, The Time Pod, 3,470). By doing so, it makes it easier for us to find in our inbox. Send submissions via e-mail to steven@grimtrojan.com. The author will hereby grant and assign to Grim Trojan (Steven Moore) the non-exclusive rights to publish in the English language or any other language in book form and ebook. Other than the first, second and third cash prizes, there will be no payment for acceptance. Stories must be original science fiction or fantasy works by the person submitting the work and the work must NOT be previously published. The author will retain all rights to the stories submitted. Stories must be rated from G-PG-13. No rated R or X materials will be considered. If accepted, we will also ask for information on you, a short bio, web site, social media, and links to your other available books/stories. The next book in the Runes & Realms series will feature the top three entries for this book. The book will be titled Runes & Realms: Stories of Froghaven. All story entries must take place in the Runes & Realms forests of Froghaven. MAXIMUM of 15,000 words—no minimum. Below is some basic information about Froghaven. A 60 page pdf of excerpts from Runes & Realms: Gnome Legends has been created to provide you with everything you should need to write your stories. If you need more information, find a copy of Runes & Realms: Gnome Legends, but—again—the pdf and information below should be enough. Download Runes & Realms excerpts for contest here. *Because the stories take place in Froghaven—because it's in the Runes & Realms world—Grim Trojan retains all rights to any story submitted Runes & Realms contest. Please do not send any work you do not wish to lose publishing rights to. If you are unwilling to give up the rights to your submission, consider creating an original story for the above Sci-Fi/Fantasy Anthology. The authors keep the rights to any work submitted to that contest. Standard manuscript format means margins of at least 1 inch all the way around; indented paragraphs (0.25" please) (NOT TABS); double-spaced text; Arial, Times New Roman or Garamond in 12 pitch with Justified text. Make sure the header includes your name and/or the title of the book, and the footer has the page number (on every page). Title your work: Stories of Froghaven — Your Story Name — Author Name. In the subject line of the e-mail, include Stories of Froghaven, last name, title of work, and word count (e.g. Stories of Froghaven, Moore, The Frog Prince, 3,470). By doing so, it makes it easier for us to find in our inbox. Send submissions via e-mail to steven@grimtrojan.com. The author will hereby grant and assign to Grim Trojan (Steven Moore) the exclusive rights to publish in the English language or any other language in book form and ebook. Stories must be original works by the person submitting the work and the work must NOT be previously published. Grim Trojan will retain all rights to the stories submitted. If accepted, we will also ask for information on you, a short bio, website, social media, and links to your other available books/stories. A mountain looks out over the valley to the north. The mountain is called Sanctuary Point after the fort that rest at its top. The mountain is covered in green plants and flowers in the summer and snow in the winter as is the valley. To the south—off the cliffs of the mountain—is the tropical forests of Froghaven. Often a fog forms at the base of Froghaven as the air around it meets the Froghaven air which is always warm. A large stone bridge crosses into Froghaven from the mountain next to it. There—like the rest of the perimeter of Froghaven—Frog Riders (their elite soldiers) stand guard in the massive trees of the forest. Froghaven was formed around a massive crater created during the Great Battle. Over time the crater filled with water and became the lake at the center of Froghaven. Often referred to as "the Pond", the lake's magic enriched waters have created the tropical environment of the area as well as mutated most things that live there. The trees are massive in height and diameter. Mimic vines—animated vines that feed off the life force of animals—are common. Many of the creatures living there are larger in size (like the frogs which are the size of a small horse) or have other unusual characteristics. 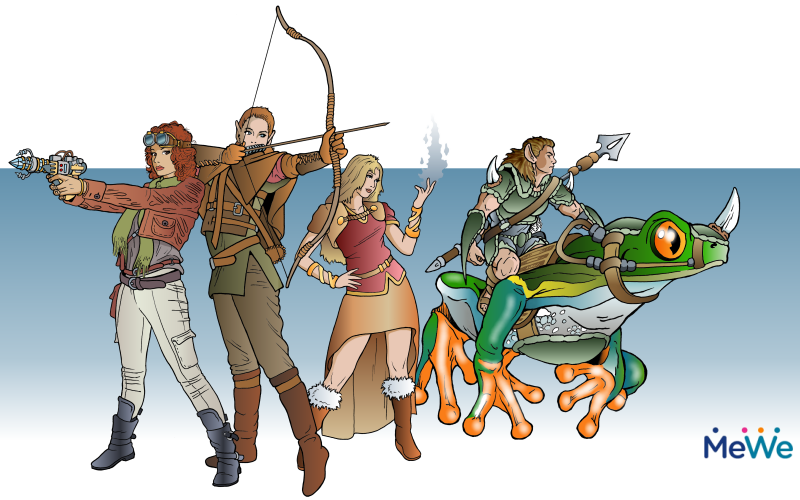 The Branchers and Meremi are the only races that can live in Froghaven more than a few days. Because their bodies are not affected by magic they are not changed by their surroundings. Other races—and animals (not from Froghaven) that cross into the forest—begin to mutate and eventually die. The name Brancher is derived from the fact that they live in the tops of the massive trees of Froghaven. There are two animal exceptions to the effects of the magic of Froghaven. The unicorn and deer are the only animals not of Froghaven that can enter and leave without being affected. Unicorns are magical creatures protected by the magic in their horn. Deer are the opposite of unicorns and, like the Branchers, are completely immune to the effects of magic. There are four villages in Froghaven—one on each side of the massive forest (north, south, east and west). The villages have been created over the centuries by weaving/training the branches of the live plants into roadways, floors, roofs, etc. The largest village is near the stone bridge into Froghaven and is the capital. The Branchers welcome most anyone into Froghaven, but are strong on ceremony. If someone enters their woods without first visiting the king, they will be escorted out of Froghaven. Below the waters of the Pond, live the Meremi. A variation of Brancher, they have webbed hands and fins flowing from their feet. They breathe water, but can survive for a few hours in the air. The Meremi do not welcome visitors, but will tolerate those accompanied by Branchers. If a party of adventurers have a mage/magic user/wizard with them, it is possible the mage has the skill "create breathe water potion." Though this uses magic to create, it is mostly a learned skill mixing the right ingredients. The most important ingredient is the purple flower of the mimics that grow at the edge of the Pond. With the skill, the wizard has a 70% chance of getting the potion right (only one way to test if it works—attempt to breathe water). If unsuccessful they will have to start over with new ingredients. The potion is only good for a few hours after it is created. Once taken, water is transformed into air as it enters the adventurer's mouth. The effects last for 6 to 8 hours. When the mage takes their first breath underwater they will know about how long it will last. Branchers are found only in the forests of Froghaven. Branchers tend to be shorter than Elves and taller than Gnomes. It is unclear from which race they originate—they have larger, rounded ears like Gnomes' ears and their ears nearly point at the ends like Elves' ears. They have a greater dexterity than Elves and ride far greater than Gnomes. They have a thick leathery (almost reptilian) skin that provides some natural protection. Because they rose in the magic saturated lands of Froghaven, Branchers are not affected by magic and cannot manipulate magic. An attack by a Brancher using a magic item is the same as a non-magical version of the item. Any attack on them via magic in turn is reduced to what it would be if it were not magic—a magical sword is just a sword. A Brancher's attack using a standard weapon will attack a magic being as though the item were magic. No plusses added to the attack, but if a creature requires a magic item to be attacked, the Brancher can attack with a normal item and do the regular damage of the weapon. Magic spells that utilize things like fire or ice—since those have properties outside of magic—will do half damage to the Brancher. Magic potions do not affect Branchers, but healing potions do help them (just as the potions affect others) because all healing potions have water from Froghaven's lake as their key element. Branchers are able to survive underwater for several hours before having to return to the air. They are called Branchers because they build their homes in the branches of the giant trees of Froghaven. Since the giant frogs of Froghaven are plentiful and their skin gives off a paralizing poison, Branchers like to dip the blades and points of their weapons in the frogs' poison. Only Branchers can be Frog Riders. Frog Riders are fighters with incredible riding skills. Their main weapons are darts tipped with poison (from the frogs) and a javelin or spear—also tipped in poison—that can be used as a staff when needed. Because of the size, durability and dexterity of the frogs they ride, the Frog Rider is capable of using the frog's mass as a weapon. Frog Riders are master riders and are not limited to frogs. They can, in fact, ride most mounts they encounter. (Later to be known as Dwarves) Dwellers are a variance of Gnomes who live in shelters carved into the mountains where they dig tunnels to mine metals and grow mushrooms, fungus and other things that grow well in dark dampness to be used as food and medicine. Dwellers are often included in travel ventures because of their healing skills as well as their ability to work with metals and mend weapons and armor. Given an option, Dwellers prefer not to ride animals. They prefer to walk or ride carts. If forced to ride a mount, they try to make it as large and slow an animal as possible. There is one large "town" carved into the base of Sanctuary Point where its base meets Froghaven. The dangers of Froghaven's magic disappear a short way into the caves that make up the dwellings. Meremi are found only in the lake of Froghaven. They tend to be shorter than Elves and taller than Gnomes. It is unclear from which race they originate—they have larger, rounded ears like Gnomes' ears and their ears nearly point at the ends like Elves' ears. They have a greater dexterity than Elves and ride far greater than Gnomes. They have a thick leathery (almost reptilian) skin that provides some natural protection. What distinguishes them from the Branchers is that they have webbed fingers, fins off their feet and they breathe water. Because they rose in the magic saturated waters of Froghaven, Meremi are not affected by magic and cannot manipulate magic. An attack by a Meremi using a magic item is the same as a non-magical version of the item. Any attack on them via magic in turn is reduced to what it would be if it were not magic—a magical sword is just a sword. A Meremi's attack using a standard weapon will attack a magic being as though the item were magic. No plusses added to the attack, but if a creature requires a magic item to be attacked, the Meremi can attack with a normal item and do the regular damage of the weapon. Magic spells that utilize things like fire or ice—since those have properties outside of magic—will do half damage to the Meremi. Magic potions do not affect Meremi, but healing potions do help them (just as the potions affect others) because all healing potions have water from Froghaven's lake as their key element. Meremi are able to survive in the air for several hours before having to return to the water. Meremi are skilled at riding large marine creatures. Their weapons are typically spears and knives dipped in the toxins of poisonous marine life. In the world of Runes & Realms, all living things are affected by magic—usually in the form of mutations. Mimic Vines are living plants that—from years of exposure to magic—have become moving creatures that seek out animals and drain their life essence. They are called mimic vines because they will "mimic" the slow movement of a plant blowing in a gentle breeze to look like the plants around them. Mimics are called "mimics" because they try to behave like the body the vines have taken control of. When plants are mutated, they are like soulless animals and become hungry for life essence. They attack and drain the life energy from any animal they can catch, but never get more than a small fraction of their victim's essence. If the magic that created the mimic plant is strong enough, it will mingle its roots and branches into the body of a killed animal and "mimic" the actions of that animal like a puppet. Because they only get a fraction of the animal's essence, the movement is usually jerky and unnatural. It will animate the creature until it completely rots apart. Mimic vines/mimics can't move beyond the range of the magic item that created/mutated them unless another—more powerful—magic item is encountered. There are places where the entire area is saturated with magic. This is usually in structures like the ruins of an old temple or the grounds of a major battle of magic or the burial site of powerful wizards. In those places mimic vines are created and sustained by the location. The larger the area, the farther the plant/mimic can roam. In Froghaven mimics and and mimic vines are very common and are free to roam through all of Froghaven. On rare occasions the magic item that created and sustains the mimic plant that animates a mimic is located on the body of the mimic. This could happen if someone with a powerful magic item is killed and the magic item stays on their body or someone purposely places the item on the body of the mimic to create chaos. With a mobile magic item the mimic can move beyond the usual area confines at the very slow speed of the mimic vines. If a unicorn dies and the horn is not removed the mimic unicorn would also wander in search of life essence. Mimic vines can't feed off the life essence of Branchers. The plant will attack a Brancher if disturbed, but can do little damage to their thick skin and will usually release the Brancher after a few minutes. Branchers cannot be turned into mimics, but a wraith could use his vines to control the body of a Brancher like a puppet. Mimic vines are often found in small groups. It's common to have to battle several mimic vines, several mimics or a group of mimic vines and mimics at the same time. On rare occasions a being will survive a mimic vine's attack and bind with the plant. This usually happens when a magical item that protects the life essence of the victim is present. The resulting creature maintains its life essence, but gains the hunger of the mimic plant. With little exception, wraith are bound to the area near the magic that created the mimic plant and hunt any animal they can get for their life essence. Like mimic plants, the larger and more intelligent the animal, the more it is desired. Whatever skills the being had prior to being taken by the mimic vines remain after turning into a wraith. A mimic wraith who was an archer will be able to shoot their bow and attack with the vines. A wizard wraith would have their collection of spells and the vines. Typically the magic that keeps a fighter alive is in their armor or weapon. Fighter wraiths typically have magic armor and weapons plus high level skills. If the magic possessed by a wraith is powerful enough to sustain the mimic vines in its body, the wraith can travel away from the spot it was created. Otherwise it is stuck in the area (often a magic saturated area like a temple) and cannot leave. If it is able to leave, it must carry the mimic plant with it and thus its movement is slow. On a rare occasion an animal will be transformed into a wraith. This usually happens when someone purposely places a magic item on the animal that will keep it alive and then force it into a large mass of mimic vines. This is usually done to create a guard to treasure. This rare event can also happen if the creature's natural magic is strong enough to keep it alive while infected with mimic vines. It is not unheard of to encounter a unicorn wraith. It attacks as a unicorn and with the mimic vines. Because the unicorn's horn is the most powerful natural magic to exist, the unicorn wraith is able to carry the mimic plant on its back and is not tied to one location. If the mimic vines that form a wraith detect a more powerful magic item or creature, they will try and take over that victim as its host and leave the current host once the other character is subdued and infected. Due to the unusual magical properties of Froghaven, a mimic wraith cannont survive there for more than a few weeks before the vines in their body become strong enough to kill the host and turn them into a mimic. Thus mimic wraiths are very rare in Froghaven. Logan admired the throne "room"—for want of a better word to describe it—as they approached it. The floor was formed in much the same manner as the walkways, but in more decorative cross patterns. There were no walls, but a labyrinth overhead of branches and vines ornately worked together to create an effective and very beautiful roof. At the far end of the large area was a throne, shaped from intricately carved pieces of ivory woven together with more branches and vines. Sprawled across the throne sat a young brancher who Logan guessed to be just a few years older than himself. He wore colorful hides and a thin silver crown woven together to simulate vines. Wasser wore armor similar to the soldiers around him, only his was blood red and somehow shinier. Logan realized that the king's armor, unlike the reptile scales of the other armor, was formed from dragon scales, larger than any he had ever seen before. Tearjon had once told Logan that as part of their rite of passage, branchers were sent into the woods alone to hunt down the creature that would be used to construct their armor. When they returned, their family worked together to build the suit. He could only imagine the battle the young prince had endured to acquire armor from a dragon. King Wasser wore a crown much like the prince's but with gold, silver, and platinum vines with green gems forming their leaves. The man filled his royal armor with impressive muscles that showed at times where the scales overlapped as he moved. Runes & Realms™ is a work of fiction. A similarity of names, characters, places and incidents with other fictional or actual persons, locations or events, living or dead, is entirely coincidental. All rights reserved. Nothing on this page may be reproduced in its entirety or any portions thereof or in any form without permission.